Since opening a sister restaurant around the corner from flagship eatery Maximillians Grill in Cary, chef/restaurateur Michael Schiffer renewed a longtime passion for crafting first-rate gourmet pizzas. Some years ago, his original pizza-centric restaurant in Cary was closed after nearly burning down. Leave it to the imaginative Schiffer to create a peculiarly named pizza like, ahem, Libido. (Don’t worry, reader. I promise to keep things tasteful.) The pizza contains slightly warmed beef Carpaccio, wild mushroom tapenade, shiitakes, fontina and truffle oil. Trust me: it’s amazing. Other distinctive concoctions include popular pie Fig & Prosciutto (featuring homemade fig jam, ham, gorgonzola, glazed walnuts and caramelized onions); El Kabong (grilled spice crust steak, smoked jalapeno pesto, poblano peppers, jack cheese, cilantro and mozzarella); and Garlic Littleneck Clam (chopped littleneck clams with fresh garlic and much more). There are additional tantalizing menu options like gourmet salads, pasta dishes and fresh seafood. Servers are generally eager to please, and the restaurant’s cozy, dimly lit space makes for a great date-night spot. 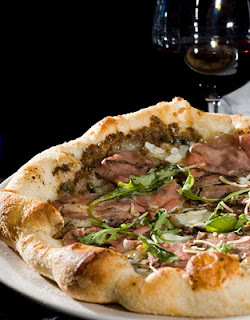 Maximillians Pizza Kitchen is open for dinner only Monday through Saturday. Reservations are accepted.